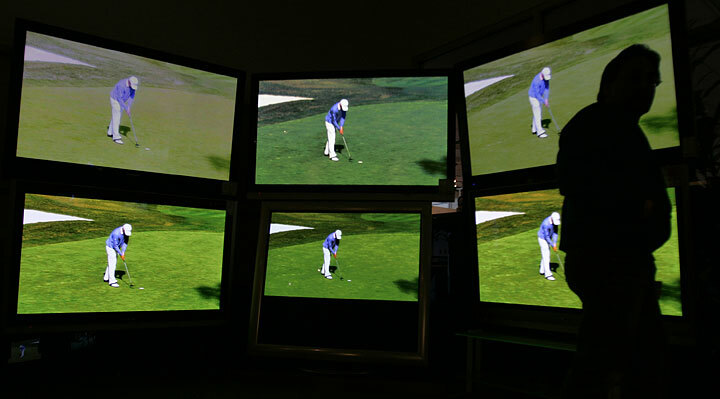 CHICAGO » Mark Smithe admits to a moment of doubt before shelling out $10,000 for a 65-inch high-definition, flat-panel, plasma TV and related gear last week. The hesitation was brief. He's a Bears fan, after all, and what better way to experience the Super Bowl than to see and hear every Brian Urlacher glare and crunching hit through a system with 2 million pixels and theater-quality speakers? "It's a little bit of keeping up with the Joneses," said Smithe, one of an estimated 2.5 million Americans purchasing a new television for Super Bowl Sunday, based on results of a recent survey. "Our friends' jaws are going to drop when they see this." Just buying chip and dip and a 12-pack of beer doesn't cut it for Super Bowl parties any more. If you expect your friends and neighbors to choose your place for the big game, you may have to pony up for a flat-screen TV, digital tuner and surround-sound speakers so they can spectate with quality. Sunday's showdown between the Bears and Indianapolis Colts is amplifying, at least on the mainland, a high-definition TV buying frenzy that already was under way, thanks to a 20 percent to 30 percent drop in prices from a year ago and heavy promotions by retailers and manufacturers. "A lot of people want them and they've been waiting for prices to come down," said Mike Gatti, executive director of the Retail Advertising and Marketing Association, which conducted the nationwide survey on consumers' TV buying intentions in early January. "They're still not cheap, but they're starting to get within range of people who are saying 'Gee I'm going to get one now.'" Hawaii also has seen higher-than-average sales for flat-panel screens as fans prepare to host Super Bowl parties, said Chris Johnson, service manager at the Best Buy Co. Inc. store in Iwilei. But high-definition TV sales in Hawaii have been only steady. "Every company will have a higher forecast for flat panels during Super Bowl season ... but there hasn't been a surge in sales," he said. A representative of Shirokiya at Ala Moana Center also said overall TV sales have remained steady this season. That's partially because until yesterday Oceanic Time Warner Cable did not have an agreement with KGMB-TV's parent company to broadcast in high definition in Hawaii. "We've been informing our customers on that because we don't want to create a disappointment in the customer's eyes," Johnson said before yesterday's last-minute deal. But in Chicago, where the Bears are making their first Super Bowl appearance in 21 years, flashy flat-panel sets are in demand like never before. A surge in business that followed the team's Jan. 21 victory in the NFC championship game generated holiday-sized crowds of customers in the home theater departments of Best Buy Co. Inc. stores for days, according to the nation's largest consumer electronics retailer. Some buyers weren't waiting for installation appointments. Rushing to properly equip their homes for parties, many shoppers said they would stand their flat-panel sets on the floor for the game and get them properly mounted later, according to Mike Obucina, a supervisor at a store on the city's northwest side. "Because the Bears won, it literally made people say 'I'm done waiting, I'm going to go get my flat-panel TV," he said. Abt Electronics, a gigantic family-run store in north suburban Glenview, Ill., that claims to sell more televisions than any other single store in the country, sold about 170 large-screen TVs a day in January during a traditionally slow month gone crazy. That made it its busiest month ever for TV sales. Money isn't necessarily an object. On one recent day at the 70,000-square-foot showroom with fountains, granite and marble floors and vast aisles filled with high-def goodies, shoppers were examining 50-inch televisions by Bang & Olufsen for $20,000 and even an 80-inch set dubbed "The Ultimate Plasma TV" for $150,000. "People don't care about price," Mike Abt, president of the business his grandmother founded in 1936, said happily. "They're asking the salesmen what's the highest-quality set." Bears fan Larry Kugler bought a 46-inch flat-screen TV for $2,700 and had it shipped to his second home outside Aspen, Colo., in time for a Super Bowl party he's hosting for friends from Chicago. "I want to make the experience a little bit better than viewing it on a 26- or 32-inch glass TV," the 40-year-old Chicago cleaning contractor said. High definition, he said, "just really enhances watching a sporting event. You can get a better feel for the performance on the field." Even the non-wealthy can afford a quality system, although it will get a little pricier once Super Bowl sales end. 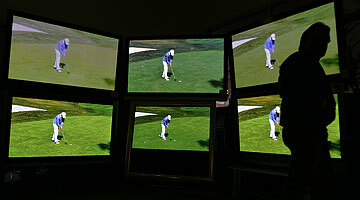 Among the biggest sellers for the month, retailers say, have been 42-inch high-definition sets for as little as $1,000. Even with additional costs -- roughly $200 for installation, $100 for cords, a minimum $200 for five surround-sound speakers and the price of a subscription to HDTV content -- the final tab could come in under $2,000. Bump the spending up to $5,000 and you can get a 50-inch set and a much better audio system. Or on an unlimited budget you can always fork over $200,000 for a home theater system. After all, a 2004 poll by Best Buy found that men surveyed would rather watch the Super Bowl on a great home theater than enjoy the game in the company of the Dallas Cowboys cheerleaders. Consumer anthropologist Robbie Blinkoff says the growing obsession with big-screen TVs on Super Bowl Sunday makes it easier for people to enjoy a shared group experience, albeit in a very American way. "It's insane, it seems, to spend so much money on a TV," said Blinkoff, who does consumer research for Baltimore-based consulting firm Context-Based Research Group. "But from an anthropological viewpoint, it has its root cause. In our culture, how we define ourselves is through what we buy." For Smithe, 42, it's about fun as he looks forward to hosting his first Super Bowl party. He made his new Panasonic the centerpiece of a great-room renovation in his loft in the chic Lincoln Park neighborhood. "Every guy wants one," the attorney said of his 65-inch plasma TV. "They want them for sports, they want them for movies, they like talking about how many pixels they have. ... I must say, people are going to be pretty impressed." Star-Bulletin business reporter Kristen Consillio contributed to this story.